1. Mix the mutton cubes, curd, red chilli powder, turmeric powder and salt. 2. Marinate for an hour. 3. Cook the basmati rice in just enough water, adding a little salt, till half done. 6. Add cloves, black cardamoms, green cardamoms, cinnamon, bay leaf, shahi jeera, coriander powder, ground nutmeg and garam masala. 7. Add the marinated meat and stir well. 8. Fry till browned and the curd is absorbed. 9. Add enough water and cook till the meat is tender. Keep aside. 10. Divide the rice into two portions. 11. 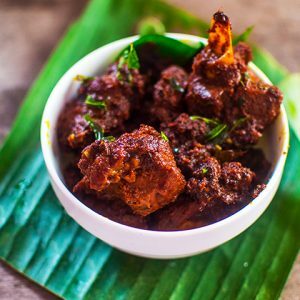 To one portion, add saffron milk, half of the cooked meat, 1/4 cup coriander leaves and 1/4 cup mint leaves. Mix well. 12. Cover with the remaining rice and meat. 13. Sprinkle the remaining coriander leaves, mint leaves and cashew nuts. 14. Cover with a lid tightly. 15. Cook on a low fire for 1 hour. 16. Remove and transfer to serving bowl. 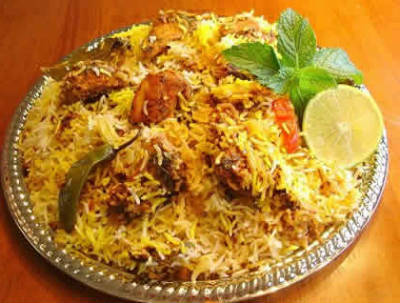 Feel free to comment or share your thoughts on this Kashmiri Mutton Biryani Recipe from Awesome Cuisine.